I'll tell what I believe, I believe that this is the real thing. Now for some facts. Honda is the best builder of motorcycles on earth! Honda brought motorcycling to the mainstream. Honda made motorcycles lovable unlike any other motorcycle company. Honda went from a unknown obscure motorcycle manufacturer to THE most dominant force in the building, racing, selling and promoting of motorcycles in the world. The most incredible thing is they did this all in the span of about 3 or 4 years. 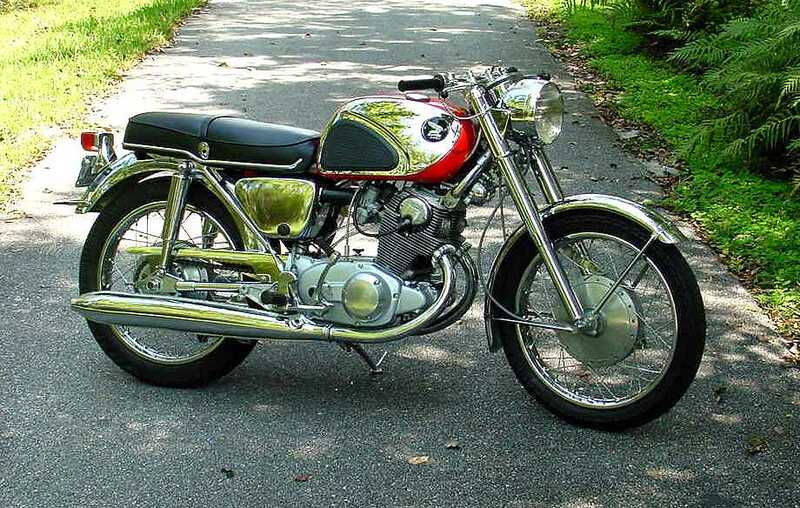 This all happened in the early 60's and the bike that typifies this spirit like no other Honda is the CB77 Super Hawk. Yes, the Super Cub 50 may be the most iconic Honda (or motorcycle) but the CB77 was the bike that made even the nonbelievers head to the nearest Honda dealer. "Chrome Superhawk. Is it another phantom; a mirage? Is it a pinnacle of achievement in the design department - a savvy marketing tactic, set upon the world already squealing with delight, or a baby in the garage of someone who is not quite sure where they end and the world begins? I don't know. All I can say is that one time a picture was attached to an email and then a discussion thread sprang up on the VJMC list. I will try to distill some facts out of that discussion and post them here in the future. Looks like the range of possibilities spans from the ol' "...someone just went nuts and chromed everything..." to "...a limited edition factory variant sent to some dealers at the end of the run to market a few remaining bikes before the new models arrived." Here are a few pictures from the web of other CB77 "Chromy's"
The bike for sale today is all chrome except for the frame and swing arm. the bike looks to be all original. all parts are standard or OEM Honda parts. the only thing I did was install an aftermarket solid state rectifier This is only visible with the seat off so it doesn't detract from the vintage of this bike. like I said I believe this to be a factory all-chrome version. Was this done at the Honda factory, was it done by Honda Of America as a one off promo, was it done by a dealer, or was it done by someone who owns a chrome shop....only Soichiro Honda himself may know. Even the "Experts" who have seen this bike, bike can not come to a conclusion. I don't believe there is any literature or even information that refers to this bike. The speedo shows 04299 miles on the bike. Everything on the bike works, the electric start, all the lights and switches, the brake-light switch, the neutral indicator, the speedo and tach....etc. The bike starts and runs with no problems. the engine sounds good. There are no known problem with the engine. Like any bike that has traded hands, you may want to go through the engine and check stuff out. I bought the bike ten years ago put a battery in it, changed the oil, took it for a few short rides, drained the tank and it sat in my garage ever since. the way you see it here is the way I bought it. The brakes are in great shape. The cables are all original and need a bit of lube. the tire are in brand new condition. they are period-looking Cheng Shin, 3.00x18 front and 3.35x18 rear. the seat is original and still nice and soft. it has a small piece of tape at the very bottom edge of the rear of both sides of the seat. this can barely bee seen unless you look close and under the seat. the original Honda stencil is still there but is very faint. The body is practically perfect and the chrome looks incredible for it's age! Remember this is a 50 year old Japanese bike and the chrome never was flawless from the factory, if you look at it in the right light you will see that it is worn from what I believe is many years of polishing. The rubber is all original and in great shape. The tank side rubber looks like NOS. The parts that are bent on EVERY CB77 are bent on this one (the foot pegs), they are as straight as any I've seen on any other CB77 even show bikes, in fact, I have never seen a CB77 with perfectly straight pegs. This bike has the "early 1962 only" short tail-light. This short tail-light is very rare. It's not only a short lens, the reflector/bulb-holder is unique to this arrangement. The bulb sits at a 45 degree angle to facilitate the shorter lens. The pipes are original and in almost perfect condition. The rear fender has a couple of small cracks under the tail-light bracket like most CB77 bike have. The cracks are unnoticeable especially while blinded by the chrome. over all, the bike is a "5 footer" as my friend called it. It looks mint from 5 feet. When you get right up close, kneel down and pick it apart you will see the usual buggered Philips-head screws, a few nicks and scratches here and there, some surface rust spots etc. This is not a "concours" bike but it will turn heads to say the least. I have a battery in there now but you will have to get your own battery. I have lots of bikes and this battery is used for most of them. Those metal emblems were on there when I bought the bike and way back in 2002 the re-pop plastic emblems were not easy to find. you can now get them easily although they aren't cheap. Take a look at these pics and see what you think. Here are a couple of videos. A walk-around and a "this bike really does run" video. 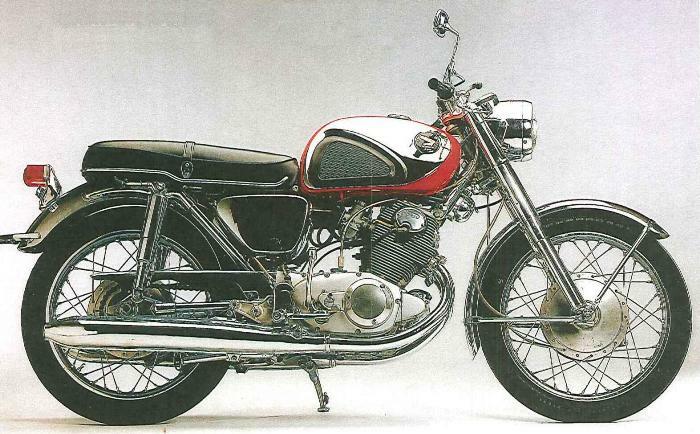 If you want to know about the Honda CB77 305 than just head over to Google. Spend some time learning everything you need to know about these bikes. Parts for these bikes are becoming easier to find thanks to people remanufacturing parts. If I were you, I would just leave this bike as is. If you are a perfectionist, than you can take it apart, powder coat frame, get new cables, buy stainless nuts and bolts, get new rubber, repaint the cases etc...it's up to you. Finding a complete and running 1962 CB77 is next to impossible. If this is in fact a factory built all-chrome CB77 than it is the one of the rarest CB77's on earth, if not than it is the best looking 1962 CB77 you will ever see. If you know anything about this bike that I don't know, then please contact me. If you think I have misstated any information than fill me in, please. I have many other bikes to build and one of them is another 1962 CB77 (this one will be in CYB trim). I just don't see a need for 2 1962 CB77 Super Hawks, so this one must go to a new home. The winner of this auction must pay a non-refundable 50% deposit within 3 days of the auction ending. I will accept paypal or a money order. I will accept cash if you pick the bike up in person. For those of you that want to pick up the bike in person, do not try to barter with me when you show up. You will pay what you bid. I will sell the bike to anyone in any country, but all shipping will have to be handled by the buyer. I will not crate the bike. if you send me a crate I will strap it in the crate. I will not ship the bike until payment, in-full, is received and clears through my bank. Payment in full must be received within 5 days of auction end. I can deliver the bike in northern or southern California for a reasonable fee (fuel, food, time). there will be no refunds. bike is sold as is so ask questions and look at the pics. ASK QUESTIONS BEFORE YOU BID! If you need more time for pick-up or want to arrange for delivery contact me before you bid. If you want to pay in full for this bike, but can't pick it up right away, contact me. Once again, contact me with all shipping or pick-up questions before you bid. If you send the deposit and never pick up the bike I will re-sell the bike (and keep the deposit of course). This is not the first bike I have sold on eBay so don't try any monkey business with me. I have bent over backwards to keep my feedback at 100%, since day one. If you have a problem, contact me first before you go trashing me. I am more than willing to resolve any problems in a civilized manner. Thank you for looking and happy bidding.